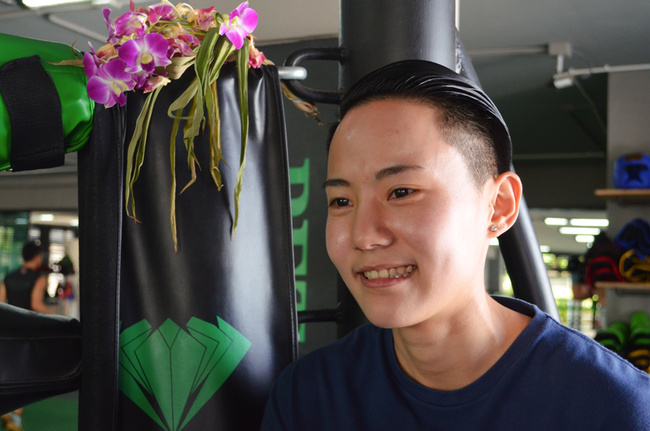 Sometime last year, Bet Yindee, a young woman with short hair and a quick smile, walked into a Muay Thai gym in the Sathorn area of Bangkok and told the trainers she wanted to try a sample session. One of the trainers watched her form, remarked that she had good technique and asked where she learned Muay Thai. "Is it good?" he asked. "Do you like training there?" "No," she said. "It's too small." The trainer laughed, said he used to fight under the Petchyindee promotion, though not the gym itself, years ago when he was a young fighter in Bangkok. Bet kept quiet about her very close association with Petchyindee, the gym she had put down as being "too small." During the entire session, the trainer never once recognized her as a member of the famous Petchyindee family. Bet was there as a spy. 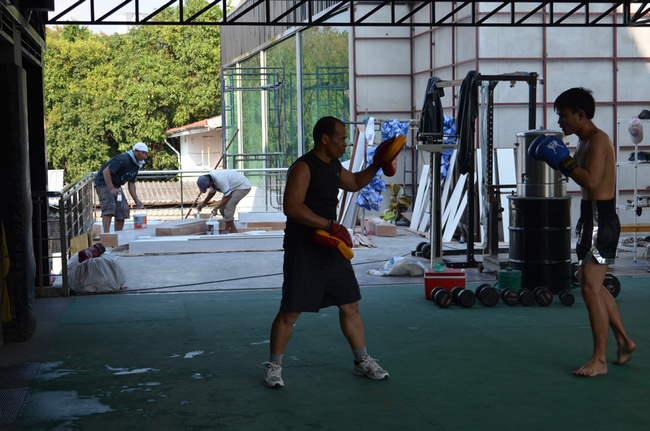 Her family was building a new gym, a much bigger one than their old location at the recently-razed Lumpinee Stadium. Bet was on a mission to see how other gyms in Bangkok handled training and marketing. The Sathorn gym was just one of a few she planned to check out. She later told her family what she'd observed at the Sathorn gym that day, what they did well, what she thought the new Petchyindee could do better. Her father listened to her ideas, thankful she'd agreed to work for her family. Petchyindee, well-known across Thailand, is partially run by a team of siblings: now in their mid and late twenties respectively, Bet and her older brother Boat Yindee are slowly taking over the Petchyindee brand. 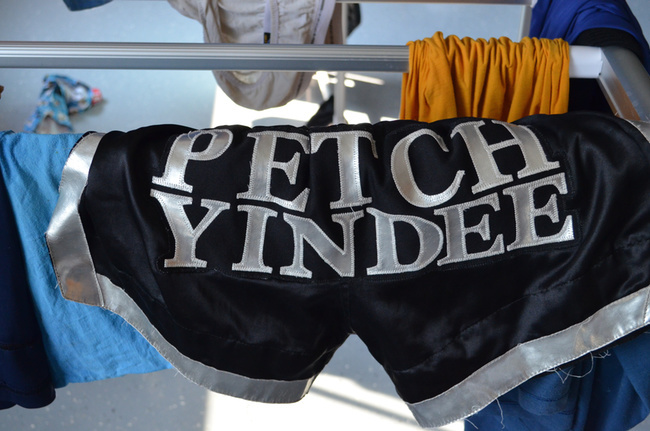 Petchyindee is a famous name in traditional Thai boxing, but this new incarnation of the "Petchyindee Kingdom" is not limited just to the sport. The new facility, parts of which are still under construction, also offers hotel-style accommodations, a restaurant, spa, and fitness center. 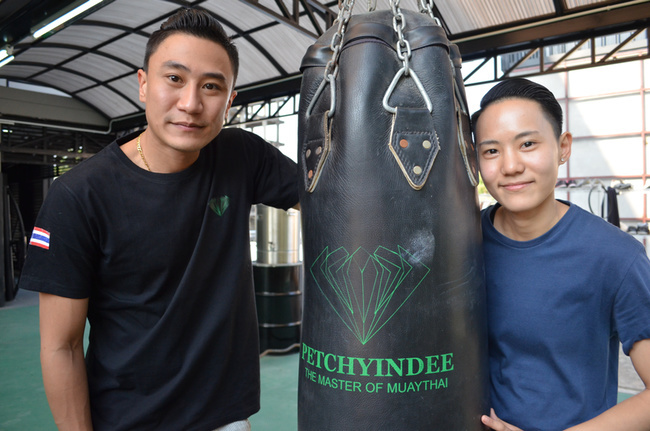 Petchyindee's new one-stop-style facility is part of a recent shift in Muay Thai culture, with gyms and entrepreneurs looking to capitalizing on Muay Thai's growing popularity among the middle- and upper-class Thai demographic. Petchyindee houses a sauna to help fighters cut weight, as well as masseuses and a spa, aimed at what Bet called "people from the stadium who like to watch Muay Thai," which I took to mean Muay Thai fans, most likely gamblers. The gym also offers group classes for non-fighters, mostly businessmen, students, and "women who want to lose weight," as Bet says. "I'm not sure why they want to do Muay Thai, but maybe it's more fun than going to a regular fitness gym." Bet attributes the rising interest in Muay Thai among average, non-fighting, non-gambling Thais to stars like Buakaw. Her brother Boat agrees, and calls Buakaw a major pop-cultural draw for Muay Thai. "His fighting style is really entertaining," Boat says. "He's okay as a fighter, but his acting in the ring is great, better than his technique." Both Boat and Bet point to large, televised promotions like Thai Fight and World Muay Thai Angels as fueling the popularity of Muay Thai among non-traditional audiences. The Petchyindee siblings aren't huge fans of Thai Fight and will tell you as much, but Bet looks to World Muay Thai Angels as an example of what her family gym's future promotions could be. "Angels did a great job with their graphic design and their marketing. On the TV, the stage, the entire production, I liked the design of it. That's why I watched it, because I wanted to see how they were doing their program and graphic design." When I asked Bet her opinion on the female fighters having to wear makeup during the World Muay Thai Angels promotion, the conversation veered to a discussion of her gym's male fighters' fashion and grooming, not a topic I commonly hear. After deciding her fighters needed haircuts, she paid her own hairdresser 7,000 baht (US $200) to come to the gym and cut everyone's hair. "At first the fighters were all afraid," she laughed. "They thought he was going to give them cuts like a student's hairstyle," (apparently a very dorky cut for a Thai fighter), "so some of them went and got their hair cut on their own [the day before] so they wouldn't need my hairdresser. But the fighters who got their hair cut [by my hairdresser] really liked it." The fighters all seem to like Bet in general. She has a cheerful nature about her, and the fighters looked relaxed when talking to her. "Our foreign fighters call me Betty," she said. "The Thais call me Khun Bet (Miss Bet) and they always ask me to give them snacks. I get along with all of them. I'm not like Boat. He's strict, like a teacher. Except for after training; then they all play games together." On the day Bet's hairdresser visited the gym, some of the fighters even elected to have the Petchyindee diamond logo shaped into their hair. Bet showed me pictures on her smartphone of the diamond design adorning scalps. Cool way to show off your gym pride, but unfortunately that kind of hair art lasts only a few weeks before growing out. Bet had to pay her hairdresser extra for the complicated logo work. Most big-name gyms have at least some kind of logo or color scheme, but Petchyindee takes it to a new level, their diamond printed all over their black and green compound. 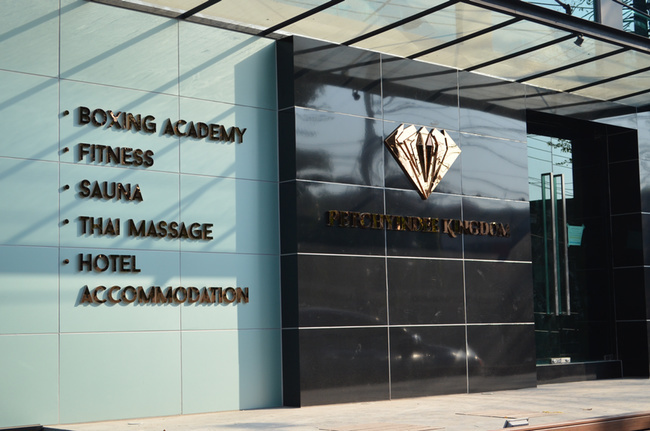 The Petchyindee diamond is fairly complex, designed by Bet herself, in hopes of differentiating it from the diamond logos of many other gyms in Thailand. Like so many children born into families with their own businesses, Bet is working for her family's brand, though it's not necessarily a career she would have chosen for herself. "When my father first started building this new complex, I wasn't going to help him," she said. "I wanted to go to England for my master's degree, but my dad asked me to help with the gym's new signage, so I agreed to take a look at it." Bet screamed when she saw her father's proposed signage, as well as the plans for the rest of the building. "I came here and said, 'Oh no, what did you do?!' The whole thing looked like some apartment block. He didn't know it was supposed to look nice, unique. I told him, 'If you put your name on an apartment, then your brand is going to be an apartment.'" Her father asked Bet to help fix the problems as she saw them, so first she tackled the diamond logo for the sign. 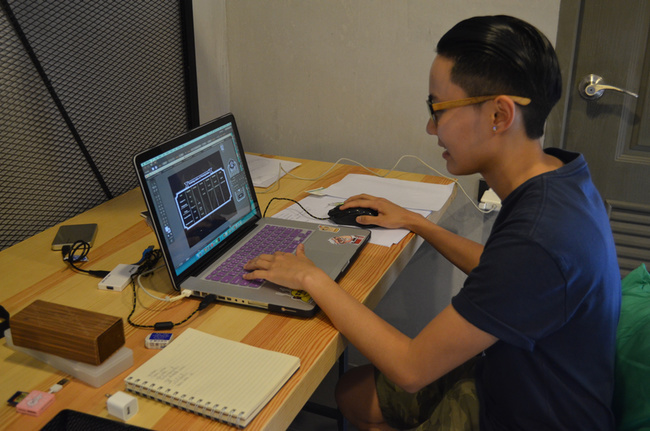 Then she was coerced into helping design the exterior of the building. After that, her father tasked her with putting together the training area. Bet balked, but her father said he needed her. "I didn't do the boxing area at first; that wasn't my job," she said. "But then I started doing the equipment, the floor of the rings, the logo on the ring and the ropes and gloves. Everything. It was a lot of work." The work is good, she says, but her family's business is not something she plans to do forever, hopefully not more than another year. Her brother Boat, however, is firmly entrenched in the Muay Thai world and will probably stay for life. After all, he is arguably Thailand's youngest major Muay Thai promoter in history, working closely with and/or managing the Petchyindee and Petchviset promotions, among others. Boat and Bet make a good managerial pair. He handles the fighters, the training, and the stadium promotion; she looks after the business side -- marketing, design, pretty much everything else. "My brother and I work well together but our jobs don't overlap very much," Bet said. When I asked her to elaborate, she put it in terms of the symbol of Petchyindee, the diamond. "Boat develops the boxers, helps them become famous, makes their [Muay Thai] ability like a diamond, but I'm the one who makes this diamond easy to touch. He creates the value of Petchyindee; I'm the one who shows this value to everyone. He puts it together, I bring it out."